The Wild Rose Moon Radio Hour is recorded live at the Wild Rose Moon, Plymouth, Indiana. Host George Schricker welcomes special guest Chicago’s Old Town School of Folk Music faculty member and Artist-in-Residence Mark Dvorak. Mark plays and sings, reflects on the art od his 30-year career, and leads a gathering of Wild Rose Moon regulars through a hootenanny. With music director John Bahler and engineer by Nate Butler of Nimble Wit Productions. The program was recorded before a live audience on November 11, 2017. Click here or on the image to access the broadcast. 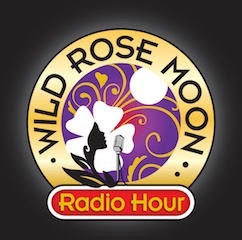 The Wild Rose Moon Radio Hour is heard in South Bend IN, Bloomington IN, Muncie IN, Indianapolis IN and Louisville KY.
“I’m just writing to thank you for your generosity of spirit and help bringing our little project to life here in Plymouth. Throughout the weekend you poured your talents and energies into your refined arts of teaching and performing. Experiencing you in action was like seeing the whole host of mentors who influenced you come to life again. Your depth of character and care and concern for others just rang out like a bell all weekend. I think I speak for everyone here when I say we deeply appreciate your mentoring. It felt like a weekend-long blessing. Personally, as a fledgling director, I couldn’t have been happier with the experience. And since I have reviewed all the footage of your concert and “hootenanny,” I can say I continue to be impressed with your performing abilities. Your ability to make a room spring to life with your stories and songs, to welcome everyone into the experience, to sing songs with conviction, and to mix that sweet voice of yours into everyone’s heart was a pure joy to witness.